After forming in 2000; Karen O, Nick Zinner, and Brian Chase of the Yeah Yeah Yeahs shot out of the gate in 2001 with their self-titled EP. Just under two years later they delivered their signature track “Maps”, which to this day still forms lumps in the throats of the skinny jeans contingent whenever it is played. While “Maps” continues to be their most enduring song, the band has continued to evolve. The art punk of their early years gave way to the addition of electronic flourishes on 2009’s It’s Blitz. YYYs are back with their fourth album, Mosquito, once again produced by Nick Launay and TV on the Radio’s Dave Sitek. Within the first few tracks of Mosquito, it is clear that the more polished sound of It’s Blitz is not the road the band has taken. The soul baring first single “Sacrilege” starts the album off and comes complete with gospel chorus. This is followed by the minimal, early Cure sounding “Subway” that features Karen O looking for her lover in a subway station with the sound of a train travelling over tracks providing the beat. The title track is a return to the band’s more raucous early days followed by the dub reggae of “Under the Earth”. While the first one-third of Mosquito is all over the map stylistically, the album comes to a close with its most consistent set of songs. The quiet “Always” gives way to one of the band’s most powerful moments in “Despair”. Over a clattering drumbeat, Karen pours her heart out. “There’s nothing to fear inside, through the darkness and the light, some sun has gotta rise”. “Wedding Song” could be “Maps pt 2” with Karen finally finding the love she had been looking for all these years. “In flames I sleep soundly with angels around me, I lay at your feet you’re the breath that I breathe”. As always with the Yeah Yeah Yeahs, nothing is ever easy. At times Mosquito sounds like a collection of b-sides and rarities rather than a cohesive album. 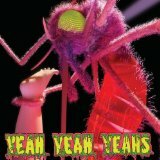 So while not all of Mosquito works and can be very disjointed at times, Yeah Yeah Yeahs as a band continue to experiment and grow with each release. After 13 years they remain absolutely essential listening and at some point are going to release one hell of a singles collection.